Moss is a small flowerless green plant which does not have roots and grows in low carpets or rounded cushions. There are, worldwide more 10,000 species of moss and some of these grow on thatched roofs. Most moss grows in moist dark areas, thus making a thatched roof with a darker aspect (ie overhung by trees) a good environment. The plant usually grows vertically in damp, warm habitats and reproducing by sending out spores released from stalked capsules. Lichen is now classed as a fungus because is not a separate organism in the sense of being one type of individual. It is actually a close partnership between a fungus and an alga. (Algae are very simple plants). Lichens live on the algae on thatch. Lichens often appear grey in colour or pale white. They are slow growing and indicate that the roof is not wearing quickly at the surface. 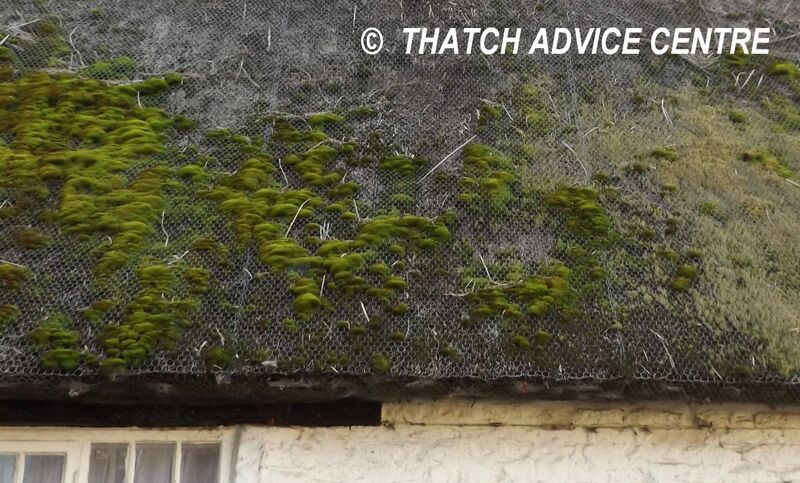 What encourages the growth of Moss and Lichen on Thatch? Moss and Lichen tend to grow more on the lee side of thatch or near trees. 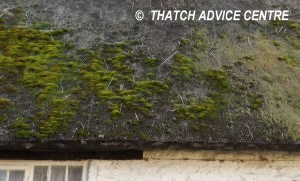 Long wet periods of rain encourage the growth of moss and lichens on the thatched roof. The moss and lichen hold moisture, making it difficult for the thatch to dry out, and making a perfect environment for the growth of more moss and lichens. The problem is that they hinder the shedding of water from the thatch and so, if removed the thatch works better. 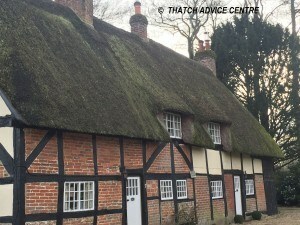 Recent wet winters have therefore meant that we have received more enquiries than usual about moss and lichen growth on thatched roofs. 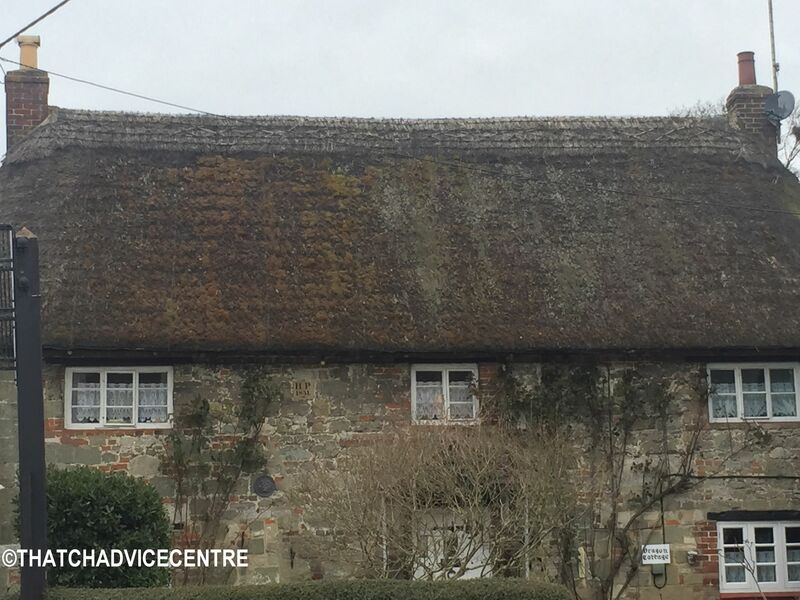 Dealing with Moss and Lichen on a Thatched roof? Moss and lichens are best removed manually from a dry roof. This is a usual part of thatch maintenance and is done when a ridge is replaced, when the main coat work can be brushed down and the moss and lichen growing on it removed. 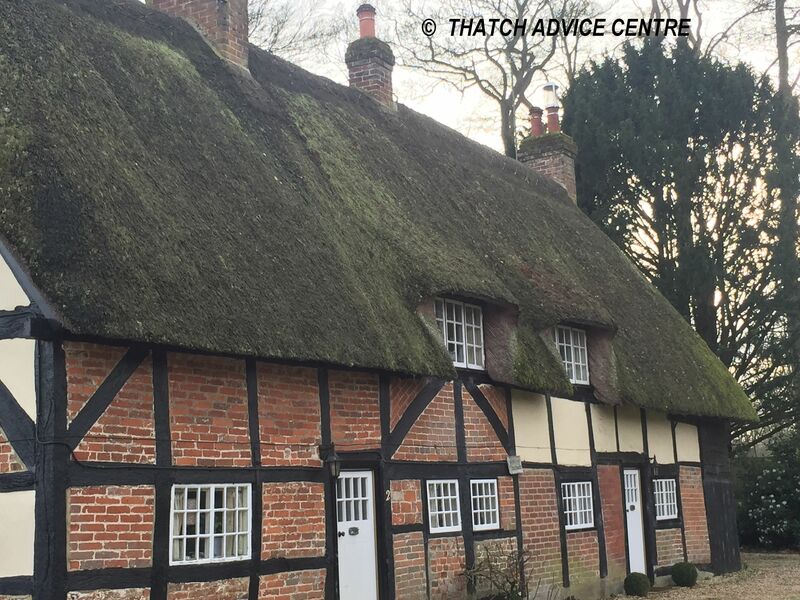 If a roof is fragile and nearing the end of its lifespan, it may be less detrimental to the roof to just leave it alone rather than risk too much damage the underlying thatch material by brushing it off. It is often the knowledge and judgement of the Master Thatcher which is relied on in such cases. Application of horizontal copper banding has been successfully used to reduce moss and lichen growth on thatch , although it is not an exact science and the distance down the roof that it protects varies with the size of copper banding used. 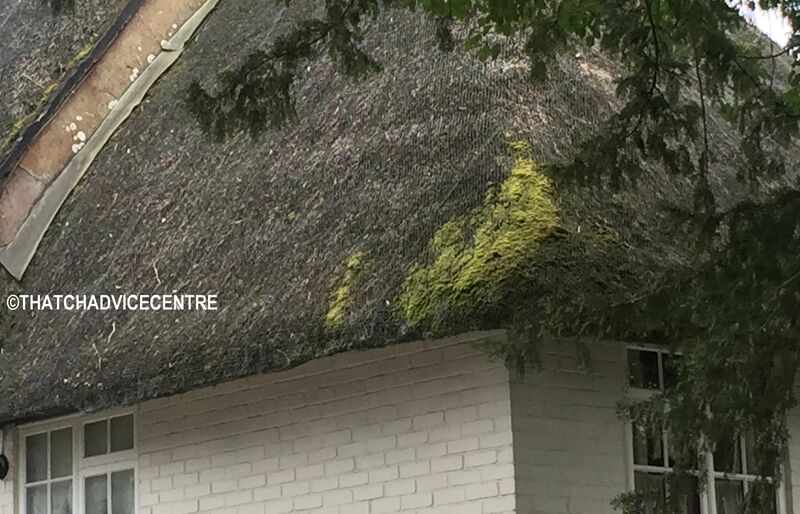 We would not want to recommend the use of commercial chemicals to control moss and lichen on thatch, that have not been licensed for this application.